Ready. Set. Tent Sale! | Bringing together stories, rooms, life. Thinking about getting a new sofa or chair for your home but haven’t had time to shop yet? This is your lucky weekend! HomeWorld is hosting their biggest Tent Sale this Saturday & Sunday. They are unloading massive containers just for this event. This happens just twice a year and is your open invitation for huge savings. 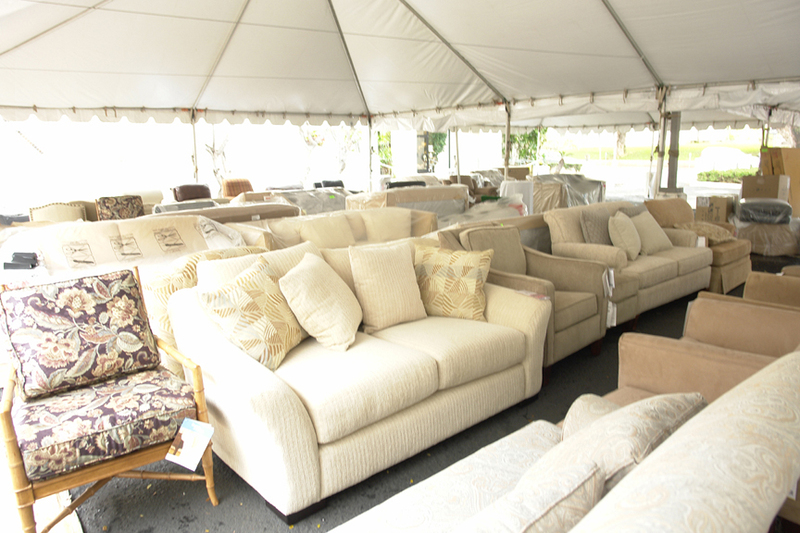 Here’s how to get ready for the Tent Sale. 1. Know what you are looking for. When your under the tent or in the store, you can easily be overwhelmed by the choices. It’s much easier to shop if you are focused. Are you looking for a sofa, dining set, bedroom group, bunkbed, sofabed, or desk? Have one or two items on your list will help you stay on task. 2. Have a budget. Of course you want the best deal. But be realistic. What’s the highest amount you can spend? Knowing your budget will immediately eliminate anything way too high so you can choose wisely from what you can afford. 3. Have the space for it. This may sound obvious, but if you are looking for a sofa, make sure you have room for it. Move your existing furniture around and measure the area for your new furniture. Jot down your measurements so you’ll know if it’s going to fit before you purchase it. 4. Sleep early! Another obvious tip. But you’ll want to wake up early so you can arrive before the crowd. Remember, many items will be one-of-a-kind so you’ll want to be able to get the best deals before they’re sold out. 5. Dress appropriately. Wear comfortable shoes and clothing. It may get hot under the tent since it’s outdoors and crowded. You will want to be comfortable so you can walk around and try out the furniture. Since there’s more items in the store, walk around the store and tent to see it all. 6. Bring a truck or van to the sale so you can take home your purchase right away. Also, don’t forget to bring rope, tarp, and tie-downs so you can transport your furniture safely. If you don’t have a truck, you can arrange for delivery for an additional fee. 7. Lastly, arrange for someone to help you move the furniture into your home. Whether it’s your family, neighbor, or friend, it’s safer for you and your furniture to have an extra hand when moving furniture. This entry was posted on August 18, 2011 by C. S. Wo & Sons, Ltd. in Uncategorized.